Rent an Apogee MQ-510 PAR meter for 7 days! Knowing the total intensity of your aquarium lights can dramatically help with coral growth and health, but the meters are very expensive and only require a couple uses right when you get your lights set up and running, making them a hard to justify the purchase. 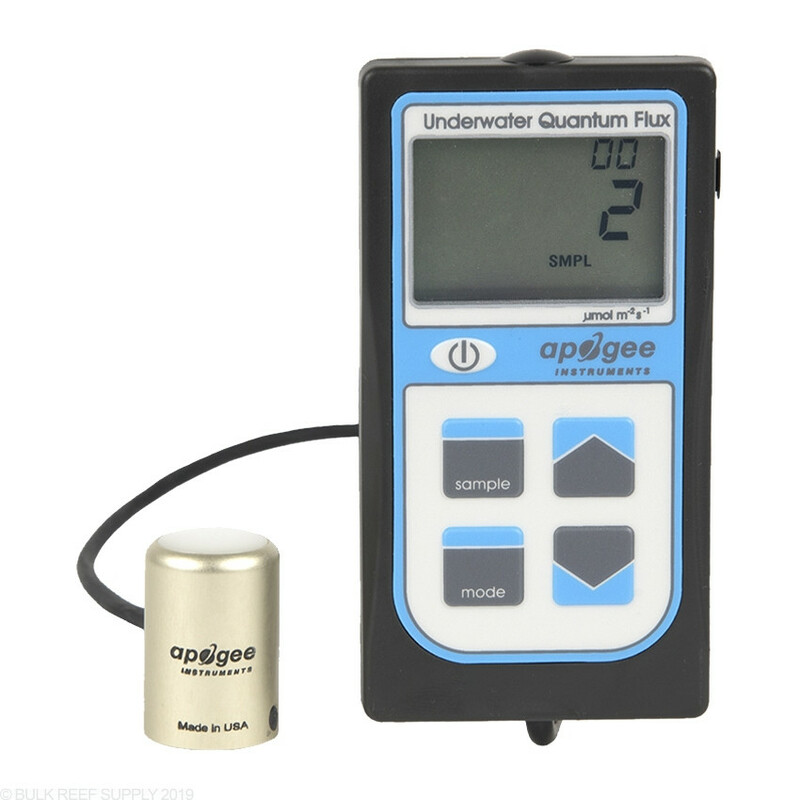 We now offer a PAR meter rental program that lets you use an Apogee MQ-510 Underwater Quantum PAR Meter and Apogee Sensor Wand for one week, giving you time to perfectly tune your lights! Increased Accuracy for Underwater LED Lighting Measurements! Apogee's MQ-510 PAR meter is perfect for underwater testing of LED light intensity and immersion effect correction factor has already been applied through the monitor's firmware giving you the corrected underwater value. The MQ-510 Par Sensor has been specifically designed to give reliable and repeatable readings underwater with LED lighting. With an increased spectral range, and larger sensing optic you will get more precise readings with all types of lighting systems. Apogee now has the immersion correction factor installed in the meter and will automatically compensate for any effects underwater readings may have. Apogee has calibrated the MQ-510 sensor with electronic lights that is stored in the firmware of the meter. Calibration with electronic lighting makes it the perfect PAR meter for any type of aquarium lighting. The sensor has a housing designed to be fully weather-proof and self-cleaning allowing years of service with minimal maintenance. No more days of looking and guessing how much light is being put into your tank. 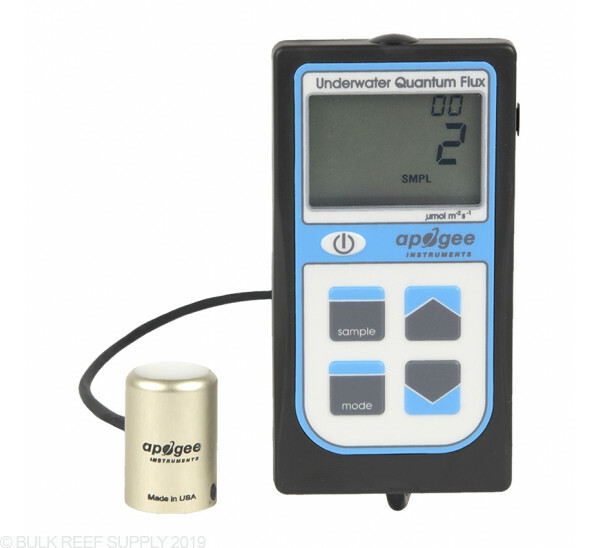 Apogee is the leader in radiation sensing devices and recently introduced the MQ-510 USB Powered Quantum PAR Sensor that now corrects for underwater variables. PAR (photosynthetic active radiation) is the easiest way to measure the available light for corals to consume and use for photosynthesis. With LED lights giving more and more control to the consumer the best thing is a PAR meter that is affordable and simple to use. With PAR readings you can monitor light degradation, clarity of the water, and intensity of the lighting schedule. Most LED lights out on the market today have more power than what your corals can take and will quickly bleach out from too much light. By having a PAR meter to monitor the light intensity you will have tangible numbers to go off of, instead of just guessing. Rental period is 7 days from the day it is delivered to your door to the day the return tracking number becomes active, so you get a full week to tune your lights! If you need to keep the meter and wand longer, no problem; the same weekly rental fee of $50 applies to each week you need to keep the meter. When you're ready to send the PAR meter and wand back, just let us know through email, phone, or live chat, and we will have a return label sent to your email right away. Just repackage the meter and wand then drop it off at any UPS location. *Deposits are fully refundable, granted the meter is shipping back to us within the initial 7-day rental period with all the included accessories in working condition. Each additional week will incur a $50 charge, that will be deducted from the deposit. Deposits can be refunded back to your original method of payment within 60 days of the initial order, or back to your BRS Reward Point account after 60 days. Nothing wrong with the service. Order completed and shipped on-time. Arrived on-time. All as expected. Meter in a box with several handle extensions. That all being said ... keep in mind that IF YOU HAVE A TANK WITH A CANOPY ... then utilizing this thing becomes a real pain in the balls. The handle extensions want to float. Then you remove them completely, and you're left trying to balance the meter on your rock so that it is pointing as straight up and down as possible while keeping the cord from moving as you close your canopy top so that your lights are actually shining down! It would be very useful if there were some weighted attachments for the wire, or even better, a kind of clip attachment for the base of the meter. So many times I would have the meter where I wanted it, but I had no way of getting it to stay. Each time I could have clipped it to a rock. Also, the instructions do not state where the actual measurement is measured. What I mean is that, since the sensor is close to 1.25" tall, is the PAR measurement you see on the display the measurement at the top or bottom of the sensor. It can make a difference. 3 stars, but for $50 and now realizing the difficulty encountered, I would have hoped that BRS would have recognized such challenges and provided some solutions. I had been trying to find a local reefer with a PAR meter to borrow for ages to no avail. Finally, BRS offered this rental service, and I hopped on the “Notify me” list. Within a week I got the email and had it ordered. The meter was extremely easy to use and gave me some awesome insight into my light setup. Return process was easy, and I was credited back my deposit on the same day BRS received the meter. Probably the best $50 I’ve spent on reef products in a long time. The only thing that would make it better is availability, but I think they’re working on that. Thanks again BRS! Excellent meter, and a great rental service by BRS. If you can't seem to get one in stock, keep trying. BRS seems to really care about reefing and their customers. I've spent the last year fussing with my LED's trying to basically guess the right light level. I kept having problems and was able to rent this unit. My lights were too low! After an easy adjustment using it, things are looking awesome finally. This is a real service to the reefing community. Thank You BRS. This is a great service for Reefers who don't want to shell out $500 for a high quality par monitor. I would not hesitate on recording and adjusting, if necessary, your par levels if you have LED lights. I have a mixed reef with increasing amounts of SPS corals, so it was important for me to know specifically my zones for coral placement. This process was very easy, and the MQ-510 Apogee unit was already calibrated by BRS when I received it. I can't say enough how easy the process was. Great information and many surprises on my par levels. Return process was quick and easy. Refund of the deposit was prompt also. Great CUSTOMER SERVICE A++++.